After a first great day in Istanbul we flew to Cappadocia for two days. Cappadocia is a small town that is famous for its rock formations and caves. Many centuries ago the region had three active volcanoes. Their lava with a combination of natural substances such as sand and stone formed amazing rocks that people carved into caves where they dwelled including royalty. The shapes of these rocks are great and some are called fairy chimneys. On day 1 we wandered around the quaint town and met some locals. We then hired some quad bikes and toured the Goreme Valleys and caves. After a dusty afternoon we headed off to the local Goreme Eli’s Hamam for what was said to be a magical experience. We started of with a face mask, 15 min of relaxing in the sauna and then a quick shower. 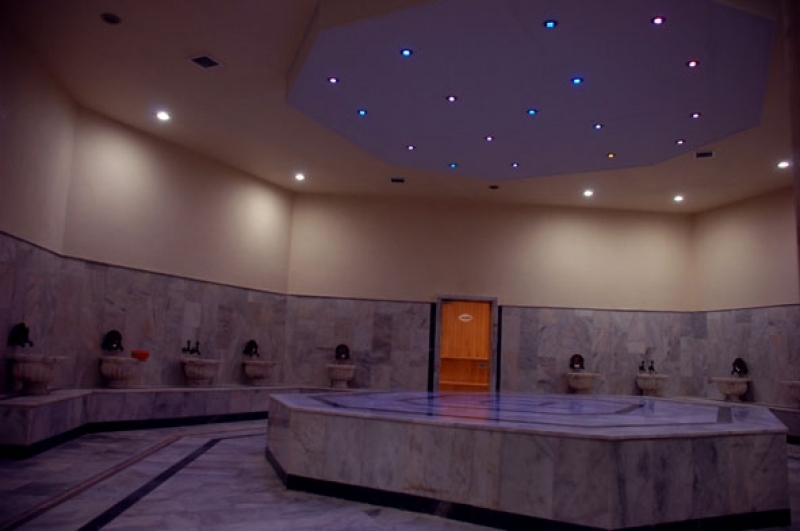 We then entered the Hamam where our designated ladies were waiting. First you are scrubbed and exfoliated till all your skin peels next you receive a soap massage with millions of soapy bubbles…literally millions. Afterwards we were asked to take shower to rinse of all the soap, we then headed into a warm pool to relax. The last treatment was an oil massage. This was a stunning experience. I now have a whole new perspective on bathing. The night ended of with a traditional Turkish folk evening. There was tons of food and we were treated to an amazing 5 course meal. Whilst the meals were being served traditional dancers entertained us with their incredible talent. The second day in Cappadocia saw us awake at 5am for a Hot Air Balloon ride. It was something we were all waiting for for a very long time. Arriving at the hot air balloon take off point was amazing as I had no idea how big the balloons actually are. The view from the balloon was simply out of this world. Reaching over 2000 feet in a balloon is such an amazing experience. The rest of the day was spent on a tour which continued to highlight the various rock formations and caves. We then had lunch at Kazan Restaurant. A 5 course meal was included in our tour and we really took advantage of it. After a tiring long day we headed to Cappadocia airport to board our flight back to Istanbul. With only one travel belt, Cappadocia has the smallest airport I have seen in the world. Day 1 in Istanbul has been everything I thought it would be and more. I anticipated this holiday and judging from today, I know it’s going to be a fabulous one. We arrived at our hotel last night; My Dora is located in Kadikoy, the Asian side of Turkey. Our room is whimsical and charming and definitely something that I wont forget. Although it was quite late when we arrived, we still wandered outside our hotel and found a Doner Kebab cafe and indulged in a midnight snack. This morning we explored the surroundings of our hotel and visited the famous Kadikoy balloon. Most of Istanbul’s attractions are located on the European side. We had to catch the ferry across The Bosphorus which only costs 2TL (approx R9) and takes about 5 min. The views from the ferry ride are absolutely amazing. Istanbul is a city rich in history and culture and this is clearly visible when one glances at the buildings. The first half of the morning was spent at the Spice Bazaar. It is too beautiful to explain, from saffron to Viagra tea, the bazaar has it all. The latter half was spent at the Grand Bazaar. The worlds largest covered market. I shopped till my hearts content and managed to get a great few deals thanks to my excellent haggling skills. An afternoon is not complete in Turkey without a great cup of coffee and some baklava. So, that is what we had to do before catching the ferry back to Kadikoy. I am in love with this Istanbul and its culture. The streets are full of amazing people (who don’t speak any English) and the buildings tell stories from many centuries back. I am definitely looking forward to the upcoming days here.